Furniture and home goods retailer west elm enlisted Digital Kitchen to bring its philosophy of “design to impact everyday life at home, at work, and away”. With the Bring Yourself anthem film, we strived to put potential investors into the mindset of travelers. Through a driving edit, propulsive soundtrack, and intriguing voiceover, we showcase the chain’s design-savvy aesthetic and welcoming, community-minded vibe. We demonstrate how an integrated digital experience can facilitate a comfortable and engaging stay, allowing guests to be themselves and experience the neighborhood like locals—with an attentive and friendly staff always just a tap away. It's just like staying at your most hospitable friend's house—and you can even bring your dog. We created a website that introduced potential investors to a new kind of hotel development opportunity from west elm. Our website reached out to investors as partners, bringing the brand’s high-end design aesthetic to life as an invitation to join an amazing opportunity. Our innovative approach to the UX led to a more sensorial way to experience the brand. We integrated newly shot footage, stock imagery, and User Generated Content into an interactive depiction of the Hotel experience. In the local section, all of the content is pulled from the accounts of real Instagram users who live in and love the neighborhoods where west elm Hotels will be located. Real world content was key to building an authentic look that was true to place—establishing west elm’s mission to respect and accentuate the local experience. A new kind of hotel development. While working with West Elm we were able to create a brand strategy that became the foundation for the film, the website, everything. To articulate this positioning, we created a website that introduced the values of the new brand to potential investors and a short film inspired by the traditional question guests have for their hosts—“what should I bring?” When you travel to a west elm Hotel, the answer will always be: Bring Yourself. 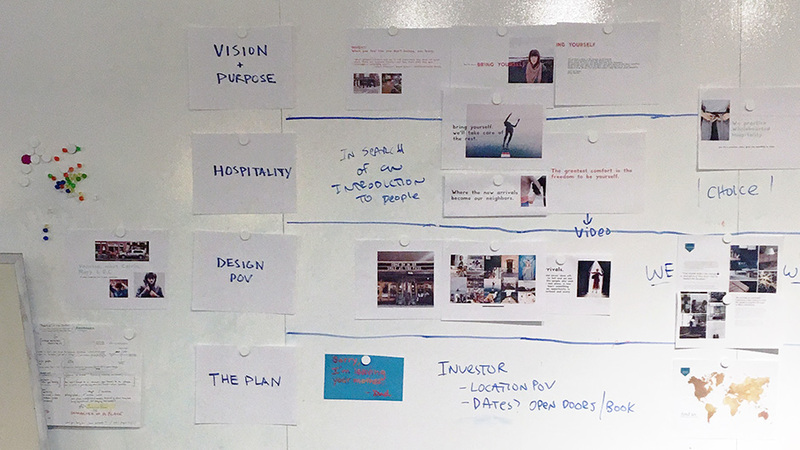 Defining the brand’s purpose, positioning, and messaging.